One of the key principles of home automation is being able to control things quickly and easily. I don’t want to have to unlock my phone, open an app, wait for it to load, and then finally find the device I want to control. I like that SmartThings supports the Today screen widgets in iOS. They let me swipe dow on my locked phone and trigger a routine. For example, I have a button set up to run “Good Night” when I get to bed, which turns off lights, locks the door, and sets the thermostat. I wanted the same in Home Assistant. It turns out that Workflow is perfect for this. If you have the Workflow app installed, here’s an example workflow you can customize. Next, add the “Get Contents of URL” action. Set the Method to POST, under headers add “x-ha-access” as the key and your Home Assistant password as the value. Set the Request Body to JSON and add any service parameters in the Request body. In our example we send a text value for “entity_id” as “group.bedroom”. Workflow is a great way to build easy-access buttons to run things in Home Assistant. 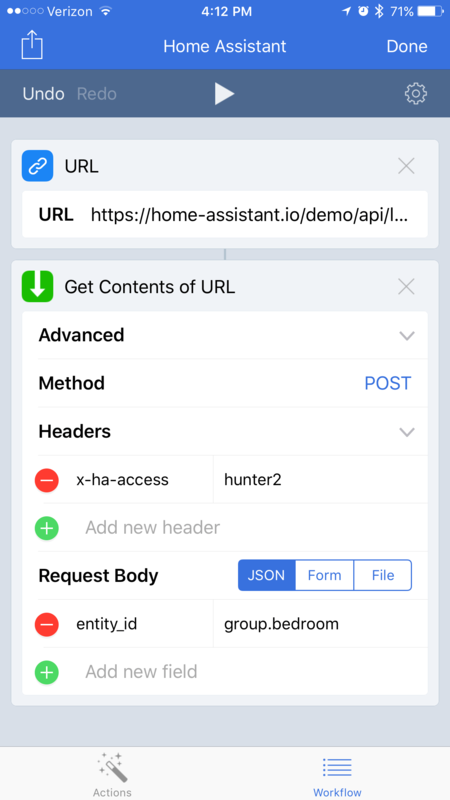 Along with the Home Assistant native app, I think Workflow is a must-have for any iOS user.